For all the hand wringing about the blue clay, this year's Mutua Madrid Open wrapped with two rather familiar figures holding the rather odd Ion Tiriac trophy. Roger Federer and Serena Williams were crowned the champions earlier today at the Caja Magica. Here are our final thoughts from the 2012 Mutua Madrid Open. In today's 24 hour news cycle, sports fans tend to have rather short memories. Before the glass cut her foot, before the pulmonary embolism that almost cost her her life, Serena Williams was the #1 player in the world, some eight years after she first claimed that throne. The intervening period had been a mix of highs and lows, the "Serena Slam" of 2002-03, the murder of her sister Yetunde Price, forays into acting and fashion, The Henin-Hardenne Hex, the first return to No. 1 in 2008, the foot fault heard round the world, and so on, and so on. In 2010, Williams had won the Australian Open and Wimbledon and then came closer than any of us would care to admit to never stepping on the court again. Since returning, Serena has taken a bit of different tack, she's not just playing the majors as she was criticized for doing over chunks of her career. She's going out and winning tour events, this year she's won the Family Circle Cup in Charleston and has added the Mutua Madrid Open to that haul. Today, she all but embarrassed the World No. 1 Victoria Azarenka who unfortunately had one of her worst performances on the court this year at the same time that Serena was unbottling vintage. In case any of us had forgotten, Serena reminded the press what her goal is in no uncertain terms. "Well," Serena said, "I don't play to be number 2." She also acknowledged that she's not alone in wanting to be the best. "I don't think Victoria plays to be number 2 or Maria does," Serena stated. "We all play to be the best. We are all out here to do the best that we can do and if that is number one, that is my ultimate goal. I think a lot of people feel that way." Serena's best has been number 1 in the past. If she can stay healthy, we're pretty sure she can be number 1 again in the not so distant future. Any serious discussion on this year's tournament has to include (as much as we are loath to go there, yet again) a discussion of the playing surface. Almost every account of the blue clay surface characterized it as quite slippery and playing more like a fast hardcourt than a clay court. Recent accounts indicate that the way the surface was laid down and rolled tight was responsible for the lack of traction; the speed of the court, we can't be sure about. Whereas initially players were concerned about the tradition of red clay (not to mention their opinions) not being respected, as they actually got to play on the surface, the concerns shifted to injury fears and the tournament's diminished ability to be considered a valid warm up for Roland Garros. Tournament owner Ion Tiriac has been adamant that "blue clay is the future," stating that the improved visuals for viewers outweighs concerns that the players have made vocally and repeatedly both before and during the event. Look, my nose always follows the money. My (wholly unsubstantiated to this point) belief is that title sponsor Mutua Madrilena wrote a rather large check to Tiriac to ensure the courts of their tournament would be blue in synergy with their logo. The change helping further leverage the alignment between the Spanish insurance & investment company and the tennis tournament that bears its name. What Mutua Madrilena got for their investment this year was a massive PR problem. Tournament organizers and sponsors, who generally are politely applauded/half ignored during trophy presentations, were whistled at and booed vociferously by the Madrid crowd. Superstars Novak Djokovic and Rafael Nadal, apart from exiting the event uncharacteristically early this year, have stated in no uncertain terms that they will not play Madrid next year if the courts are the same. If the brand indeed wanted to be a bigger part of the event, they got their wish, but surely not in the way they brainstormed. 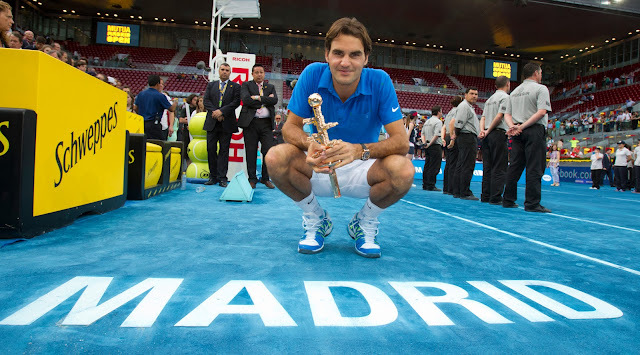 Go back to the traditional red clay next year and then schedule an exhibition on a refined blue clay later in 2013 as a test for a blue clay return to Madrid in 2014. Roger Federer is already having his best year in a few, that continued today, as he won the Mutua Madrid Open 3-6, 7-5, 7-5 over Tomas Berdych. The win boosted the Swiss great back to No. 2 in the ATP rankings and ensured Federer would win at least two ATP Masters 1000 events in a year for the first time since 2009. Since the US Open Federer is 45-3, his only losses being to Rafael Nadal at the Australian Open, Andy Roddick at the Sony Ericsson Open and John Isner in Davis Cup. Coming into 2012, Federer repeatedly mentioned being excited at the prospect of playing the Olympics at Wimbledon, but it's increasingly apparent that Federer will continue to compete for big titles all year. Perhaps some of his success in Madrid can be attributed to the surface, which was said to play like a fast hardcourt, Federer's best surface. Alternatively, you can posit that once Nadal and Djokovic said no mas to the terre battue bleu (which Andy Murray didn't even bother to show up for) Federer's chances of hoisting the trophy increased manifold. We would agree with both assertions. However, the biggest reason Federer won this tournament was his attitude in light of the challenge. Rather than complain about the conditions, Federer put his head down and set about to work. Any event that made Nadal and Djokovic uncomfortable had to be seen as a welcoming environment for the Swiss. Federer is 28-3 in 2012, only facing Nadal twice (they split their meetings) and not meeting Djokovic at all. As his rivals have become a bit less consistent, Federer has maintained his level and in doing so re-energized the race for No. 1. In fact, Federer, Djokovic & Nadal all mathematically could leave Roland Garros with the No. 1 ranking, setting up a summer where the ranking could be traded back and forth like a hot potato. While Djokovic has seen his level drop following a stellar 2011 season and Nadal has been typically up and down, Federer has been steady, taking advantage of his rivals dips and maintaining an aura over everyone outside of the top three that keep them from truly believing they can win. After Berdych fell today he said of Federer, "I am sad that I was not able to beat him, but on the other hand it is something special that I lost to him. That's how I see it. He just showed what a great champion he is...." After two long years of telling everyone he's not done yet, Federer's getting the wins to back up that claim. The 70 titles haven't dulled his desire to end the week with the big trophy and in weeks where his biggest rivals don't show up (mentally or physically) he usually does. The thing about that is, if a guy continues to build that kind of momentum, he's going to be ever harder to stop going forward, assuming his body cooperates. When asked whether he would play next week's ATP Masters 1000 in Rome, Federer said, "The body feels it when you come back from six weeks. It does hurt a bit so I just have to make sure I make the right decision come Tuesday, Wednesday. I hope I can play but I'll definitely travel there tomorrow." I think he's there, and building off the momentum of a week on the terre battue bleu, I think he's dangerous. There are specific functions present in both versions. The actual main likeness fake louis vuitton between your 2 is actually their own capability to endure below drinking water with no drawback within their performance. Additionally, there are lots of additional elements in which the 2 tend to be comparable. For example, you'll find the next functions within each versions. The scratch-resistant artificial cartier replica uk sapphire very. Unidirectional bezel, effective at switching just counterclockwise stopping the actual unintentional motion from the bezel whilst scuba diving. Brand new Triplock program right now includes a multiple gasket program which anchoring screws lower firmly on to the situation pipe as well as from the Oyster situation. This particular rolex replica sale provides an additional coating associated with safety below drinking water. Self-winding system having a never ending engine. Made from possibly strong prevent associated with 904L stainless (the stainless metal that is totally deterioration proof) or even precious metal. The actual Rolex Submariner as well as chanel replica sale the actual Sea-Dweller tend to be as well in lots of ways, however the Sea-Dweller is really a larger, weightier as well as harder sibling from the Submariner. Choose the actual Submariner, if you're in to leisure scuba diving, nevertheless, with regard to accurate expert as well as industrial scuba divers, the actual Sea-Dweller ought to be the option. The Matua Madrid Open was a spectacular tennis tournament which was organized in 2012 for the first time. The unique feature about the tournament was the color of the clay court on which the matches were played and the blue color clay court was a treat for the eyes. Most of the people were surprised seeing Serena Williams lift the women's open title in spite of her previous injuries. While in the men's open category Roger Federer became the first and currently the only man to win a tournament on blue clay. Overall this was a very memorable tournament.